A lot happened at Hamilton in the mid 1950's. Pretty much every men's wrist watch movement was "new". The 12/0 size 752, 753 and 754 movements were replaced by the new 22 jewel 770. Automatic movements were introduced to the line up and Swiss-made manual wind movements were introduced after the short-run Hamilton Illinois model line was discontinued. The revolutionary Electric 500 movement was introduced mid-late 1950's. Even the 8/0 sized 747 and 748 movements were replaced by the shock-jeweled 730 and 735 grades. 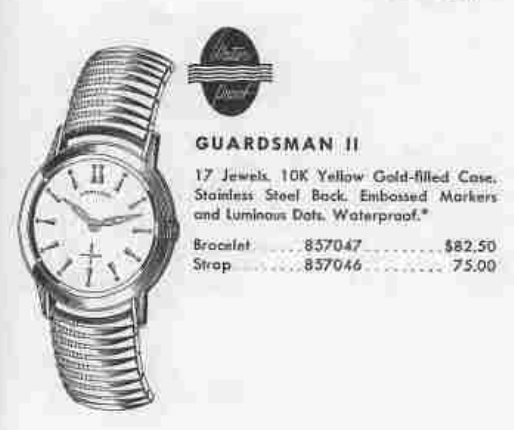 One of the models that received the 17 jeweled 730 movement was the 1956 Guardsman II. It was produced for only two years. The Guardsman II was a mid-tier model, not entry level and not high end. It featured a 10K yellow gold filled case with a stainless steel back. The white dial had embossed gold markers with luminous dots and open leaf hands. I recently landed a Guardsman II for the first time - and after almost 10 years of collecting, that's saying something. I don't think it's a particularly common model. Mine came in a very yellow condition... the bracelet was yellow, the dial was yellow and the crystal was yellowed by age. The Speidel bracelet isn't original so it will have to go. The stainless steel back comes in one piece. I prefer this design as I find it's easier to open and close than the pie-pan with threaded ring design. The crystal is crazed so a new crystal will make a huge improvement. The inside of the case back makes it easy to identify this model. Other than being a bit dirty, the movement appears to be in good shape. The yellow splotchy tone on the dial is probably failed lacquer. I'll see if I can remove it without losing the printing. Slowly my cleaning solution works it's magic but the real trick is to know when to stop. Looks like a new 27.9 mm diameter crystal will be in order. I find GS PHD crystals to be a great choice for sweep second movements. This model has a sub second so I could try a PK-style low dome but I think PHD will be the better choice. The reassembled movement is running again with good motion. It's off to the timer to see how it's performing. Not too bad. A very slight tweak to the regulator will speed it up and the beat error of 1.7ms is within my specs of acceptable. I could try to reduce it but that also risks goofing up the hairspring. The outside of the crown has been worn away so I'll replace it. There's a lot that goes into choosing a crown, believe it or not. First off is to know what tap thread the stem is. Pretty much all Hamiltons after 1952 are tap 10. This watch takes a waterproof style crown. All that's left is to choose the right dimensions. One thing to consider is the outside diameter of the current crown. It's 4.38mm so a 4.5mm replacement might work. The size of the stem tube is important and the crown is recessed in to the side of the case. That means 4.5mm might be too big (and rub the case) so 4.0mm might be a better choice. The gasket for the case back disintegrated during the cleaning process I will replace it with a fresh gasket. I think the dial cleaned up great and with fresh lume on the dial and hands the watch looks refreshed. Fortunately I didn't lose the printing but there was still one stubborn spot that wouldn't come off. The new luminous paint glows nicely in the dark. The open leaf hands look like cat eyes peaking out from the darkness.